Who wants to admit that they are eating too much sugar. . . no one does. I’ve always considered myself a healthy eater but for a while I was constantly “rewarding” myself with food aka desserts. Regardless if they were healthier treats it just got too much. I noticed how it was affecting my every day life and the most important part was that I just didn’t feel like myself. I read It Starts with Food by Dallas and Melissa Hartwig about a year and a half ago and that changed my way of eating completely. 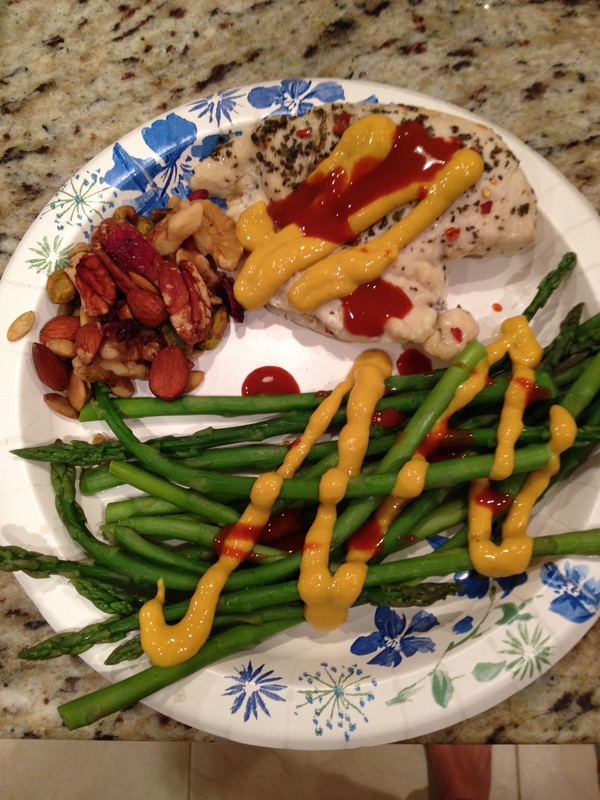 I’ve completed multiple Whole 30 challenges and eat Paleo/Primal the majority of the time. I got away from it during the peak of my race season and completely regret it. But honestly why dread on that and just move on. A jump start was necessary in a big way in order to get back into my normal way of eating. After finding the book, The 21 Day Sugar Detox I knew this was exactly what I was looking for. However the timing for my start date was horrible. I had 2 marathons coming up and after 14 days of the challenge I quit. It is embarrassing to admit that I quit but I definitely would have struggled in my races if I would have kept it up. So here I am on day one of the 21 Day Sugar Detox. Let me tell you I feel great. I know there will be ups and downs throughout the challenge but feeling myself again is the goal. The author, Diane Sanfilippo really hits everything on the dot. It definitely isn’t a gimmick cleanse. There is so much science behind it and it wasn’t boring to read whatsoever. She is helping us, the readers, to succeed just by how practical she makes the detox. There are three different levels of the detox depending on the individual’s background. I am on level 3 since I am used to eating “Paleo” but there are adjustments due to my activity level. I wont go into complete detail because you really should get the book or ebook. I wanted to discuss the challenge here and by posting a few of the days through out the challenge will help me really understand what/how certain foods affect me. I will not post every day because no one wants to see meal after meal. But I will post every once in a while as a check in. 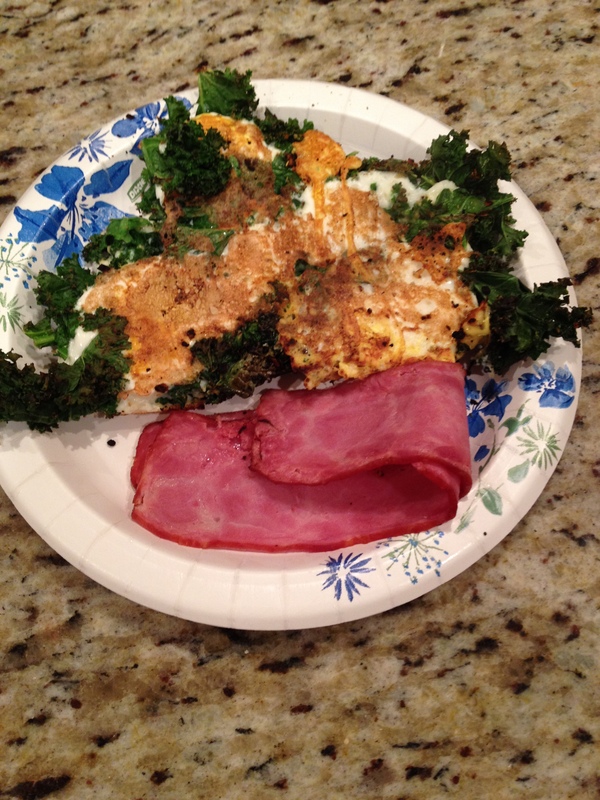 Sautéed kale in the pan with some coconut oil and Penzy seasoning then added 3 eggs. 2 pieces of Turkey Bacon on the side. 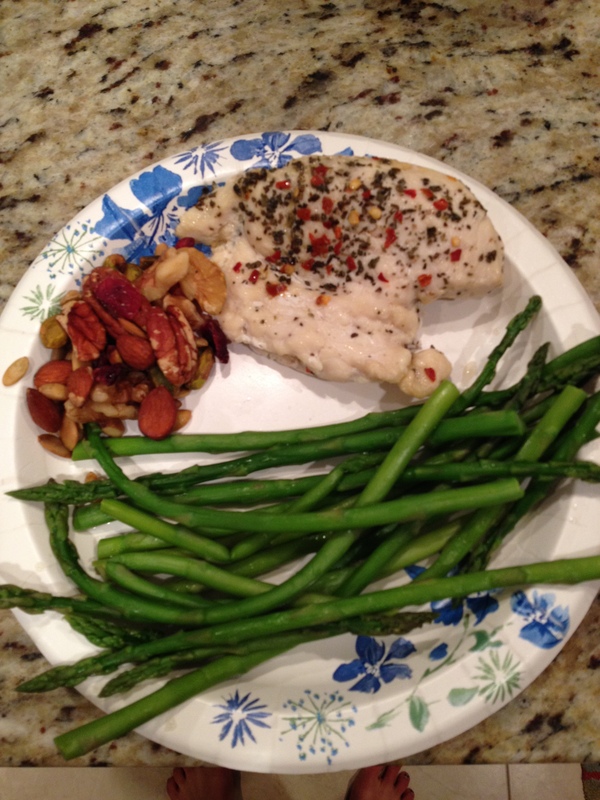 Chicken Breast, trail mix combo of nuts & seeds, and asparagus. 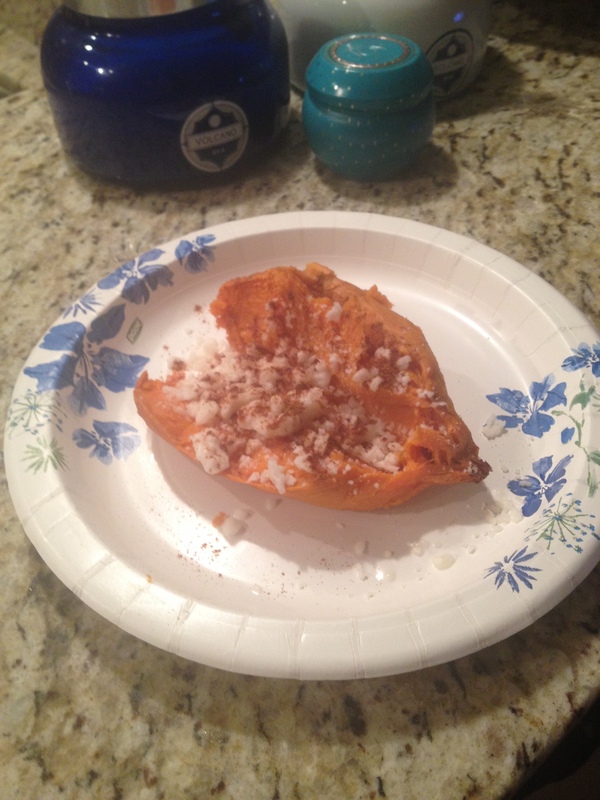 Yam with coconut butter and cinnamon after 8 miles. Did I have a ton of energy during the run? No not a lot but that was expected. Still maintained an 8:15 minute pace for an easy training run so I didn’t mind. Just tried to enjoy the weather before a possible snow storm tomorrow. As one of the adjustments as an athlete you are allowed to have a starchy carb like a yam after you workout or whenever you think best. 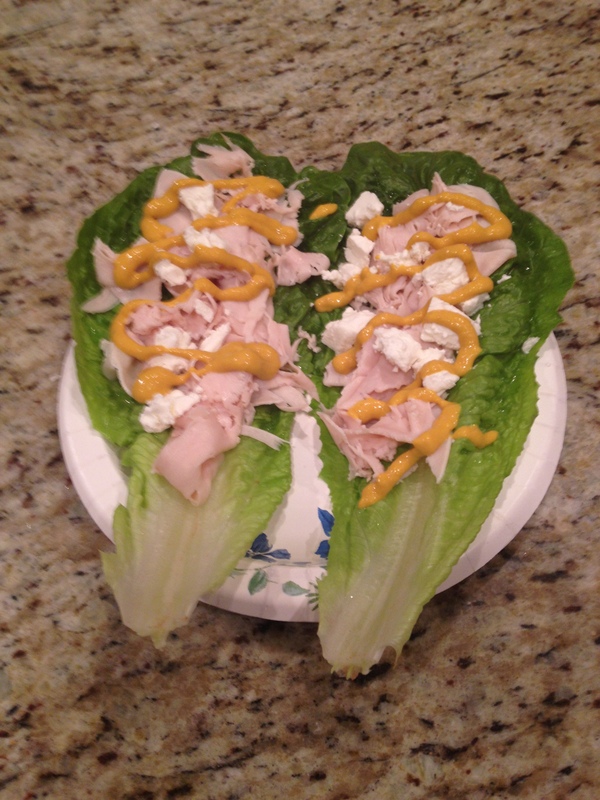 For dinner (about an hour after my yam) I had an easy lettuce wrap with reduced sodium turkey breast and crumbled goat cheese. Topped with Mustard of course. Well that is the end of day one. It was definitely simple and nothing really exciting but it was perfect for a busy day. I might eat another snack before bed if I get hungry. This detox doesn’t have any restrictions on how much or often you eat. If you are hungry, then EAT!